One of our development tools has been a program by Austin Meyer called X-Plane. You can download a trial version of the program from their website. This tool has greatly simplified the process of determining critical flight characteristics of an aircraft. While simulators that cost millions of dollars are being used more and more for aircraft design, the level of accuracy that X-plane achieves is more than adequate for General Aviation purposes, and FAR more than was used in the original design of the Velocity aircraft. It is important to understand that there is nothing different between this program and an aeronautical engineer with a slide rule as far as the math is concerned. While calculating L/D and pitching moments, the engineer would be mentally visualizing the aircraft and making assumptions. With X-plane, each wing surface is divided into eight segments and the flight properties are calculated for each segment at least fifteen times per second accounting for a number of parameters including the air density, pressure altitude, angle of attack etc. A more detailed description of the process can be found at the X-Plane engineering section. The depth of information and ease with which a number of configurations can be explored is revolutionary. Having a computer program is only half of the story though. 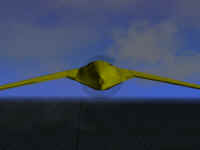 Coupled with an experienced mind, the software becomes a realistic design tool that can lead to evolved aircraft such as the Atlantica, pictured here. There are aesthetic touches like accurate terrain mapping and real-time weather that can create a very realistic flight experience for the designer or general enthusiast. Dynamic flight information can be displayed in such a way that an extremely comprehensive understanding is achieved. Austin has continued to improve the software on a regular basis, and unlike some products, these are real improvements that add versatility and interest to the program. There is also an emerging group of X-Plane fans who are developing their own aircraft, buildings, terrain and sounds for added realism. A suite of tools accompanies X-Plane that allow for the real-time comprehensive evaluation of airfoils, the design of complex aircraft shapes, the accurate mapping of realistic terrain information, importing real-time weather, graphic display of all types of weather phenomena, interaction with ATC, realistic gauge function including models with GPS and moving maps, real-time passage of time during flight, aircraft carriers that pitch and roll..the list goes on. It is a fun and serious tool.